PERSPECTIVES ON WRITING | Series Editor, Susan H. McLeod | "LITERATE ACTION, in its two volumes, makes an indispensable contribution to writing studies. Undertaken by one of the most learned and visionary scholars in the field, this work has a comprehensive and culminating quality to it, tracking major lines of insight into writing as a human practice and articulating the author's intellectual progress as a theorist and researcher across a career. 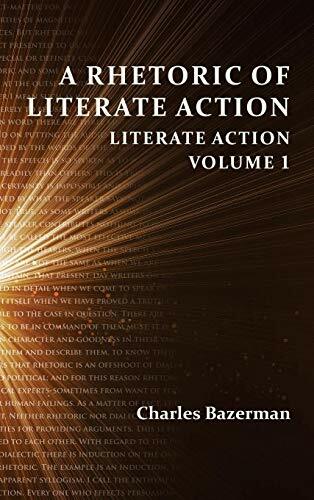 | "This volume-A RHETORIC OF LITERATE ACTION-may be one of the most radical articulations of 'the basics' of writing ever offered. In the face of a doggedly conservative instructional context that still treats writing skill as a matter of following the rules, the author excavates the much deeper psychological and sociological processes from which writing emerges and with which it must synchronize. . . .Attending to such elements as time, stance, and action, along with genre, intertext, process, and other elements, the work offers a generative vocabulary handy as both an inventional and diagnostic tool for 'the sophisticated writer,' as Bazerman calls the ideal audience for this work. It is a refreshingly honest treatment of the difficult work of writing. It is filled with useful examples." - DEBORAH BRANDT | CHARLES BAZERMAN, Professor of Education at the University of California, Santa Barbara, is the author of numerous research articles and books on the social role of writing, academic genres, and textual analysis, as well as textbooks on the teaching of writing.